Deka has invented the SmartXide DOT system that combines “traditional” and “fractional” resurfacing, offering an ultra-versatile treatment that can be tailored to the specific needs of each patient. Traditional ablative resurfacing with CO2 laser represents the gold standard laser surgery for treating skin aging. However, this method is associated with prolonged healing times and persistent erythema (abnormal redness of the skin resulting from dilation of blood vessels – as in sunburn or inflammation), and therefore it is mainly indicated for patients with very deep levels of skin aging. In laser surgery, ablative resurfacing with CO2 sources has always been considered the gold standard for treating wrinkles and damage caused by skin photo aging. However, the lengthy healing times and persistent erythema associated with this method mean that it is not suitable for everyone. In recent years, the market has focused on less invasive systems and methods designed to meet the patients’ desire to be able to continue their work and social activities without interruption. This has resulted in new methods and protocols that combine a high degree of efficacy with shorter post-treatment recovery times. The natural effects of aging, sunlight and exposure to air pollution cause a gradual deterioration in both the structure and functions of the skin. SmartXide DOT has paved the way for a new generation of CO2 lasers. The Madonna lift procedure utilizes Smart Dot Therapy to reduce the appearance of fine lines and wrinkles and lifts the eyebrow for a younger look to the eye. 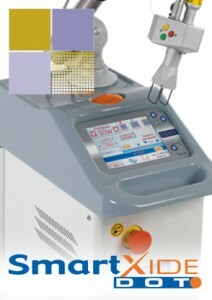 This tool has been used to perform a variety of functions, including skin resurfacing and the treatment of acne scars. Now it can give men and women a younger look by focusing on the eyelids and the rest of the eye area.